AUGUSTA, Ga. – It is only Thursday afternoon. Fifty-four holes remain in this exalted intimate golfing get-together for 87 gentlemen golfers. The rest of the week was always going to be interesting no matter who shot what in the first round of this 83rd Masters tournament. But now it promises to be more interesting. Tiger Woods shot 70. Tiger Woods his own self! Two under par. He’s on the board, in its northern reaches, this four-time former winner, now 43 years old, playing on a repaired knee, a fused back and work-in-progress head. The day was warm, the wind was swirly, the pins were tough, the greens were firm, the day was long. Seventy. What can be said with certainty in this mad age? Only this: Tiger Woods will be in this thing until it’s over, whenever that may be. And with that grand and sweeping statement, we will now take your imaginary questions. 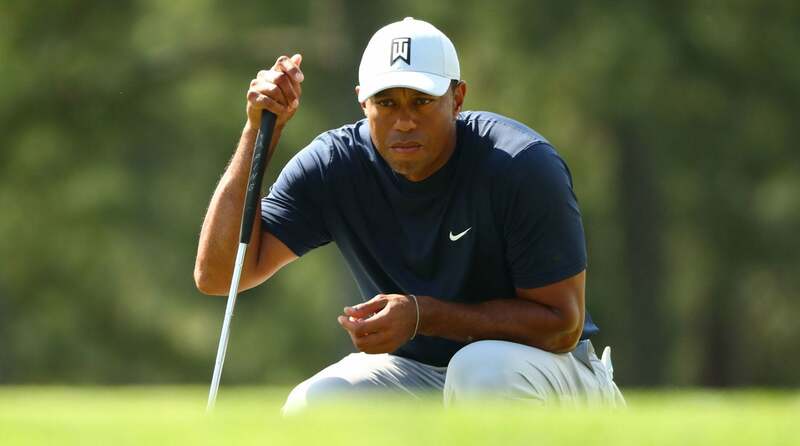 Tiger Woods is in the hunt through the opening round at the 2019 Masters. Q1. How can you be so certain he’s sticking around? A. Because he is swinging all 14 clubs with authority (putter included). He’s hitting draw-shot drivers as needed, controlling the distance of his irons almost with back-in-the-day accuracy and lag putting well. Two of the best things you can do if you want to win a Masters is to not three-putt and keep your ball dry. So far, so good. Nothing wet. A three-putt from the front edge of 17. Q2. How do we know this is not all part of PR campaign from Frank the Talking Headcover Public Relations? A. Did you see the tee shot on 11? For about a decade now, Woods has had to aim into the left trees from that tee, hit a super-hard hold cut and pray that the ball curved. None of that was vintage Tiger. It was wing-and-a-prayer Tiger. On Thursday, he stood on the left side of the tee box, on a humid afternoon that was perfect for his healing body, and smashed a full-release towering drive with about four yards of draw. On one par-4 after another, he hit approach shots hole high, lagged it close, tapped it in. (Low-stress living is a beautiful thing.) As for water avoidance, the Thursday round was his 83rd competitive round at Augusta National. Plus, scores of practice rounds. He knows where to not hit it, and for whom the bell rings. Q3. Were there many Frank the Headcover golf shirts out there? A. If there was, it was not observed by any representative of this newsgathering service. A. Deeply, deeply in the game. On Wednesday, he spent about 20 minutes on the driving range discussing the fine points of chipping and pitching the ball off the tight Augusta National fairways with Jose Maria Olazabal, a two-time Masters champion, who chipped and pitched the ball as well as anybody who has ever played the game. (It was a conversation, but Olazabal was the teacher.) Wednesday night, as the winner of the Ben Hogan award at the Golf Writers Association of America annual dinner, Woods spoke, without notes and with apparent sincerity, about how grateful he is to be playing world-class golf again. (He is ranked 12th in the world and last year he ended a five-year winless period.) In his Tuesday press-conference, he talked about driving down Magnolia Lane toward the clubhouse and how he found himself thinking about Hogan, the two-time Masters winner who himself played outstanding golf as a man in his 40s with a compromised body. At the Tuesday night Champions Dinner, a tradition started by Hogan, Woods laughed alongside all the other former winners as Ben Crenshaw told a hilarious story about attempting to shake hands with Jack Nicklaus for the first time, in a second-floor loo at the clubhouse of the Merion Golf Club during the 1971 U.S. Open, when Crenshaw was a 19-year-old amateur and Big Jack was at the height of his powers as a golfer but at that moment occupied with a more pressing matter at hand. (Tiger’s funny bone runs blue.) Nicklaus has been telling people he has never seen Woods so relaxed and confident. A. The question refers to Mr. Joe LaCava, the caddie, who caddied for Fred Couples when Fred won the Masters in 1992. Good! Joe passed through one of the club’s Washington Road gates at 7:50 Thursday morning in anticipation of his boss’s 11:04 a.m. tee time with Jon Rahm of Spain and Li Haotong of China. Q6. How’d those guys play? A. Fine? Not really sure. Q7. What happens from here? A. Woods prepares himself for long, wet days, likely with interruptions. None of that bodes well for him, the rain, playing in a rain suit, starting and stopping, if it comes to that. Still, he’s Tiger Woods, swinging good, playing good, looking good. 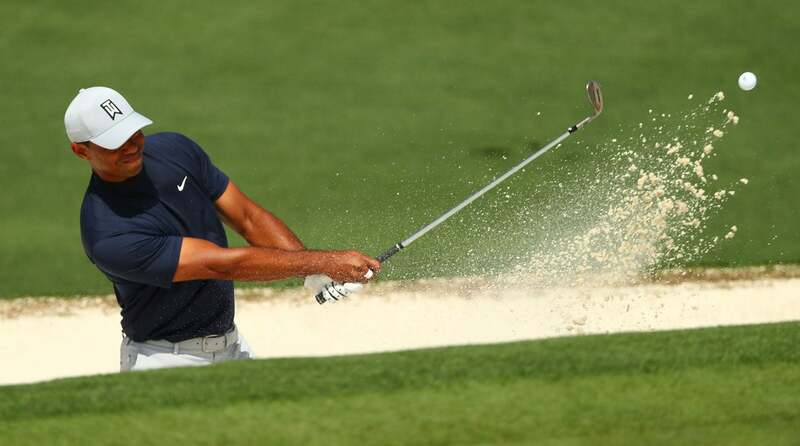 Tiger Woods hits a bunker shot on the par-5 15th hole at Augusta National. Q8. Post-round, did Tiger Woods say anything interesting? A. He has won four green coats, an emblem of victory of this distinctive event. On three of those occasions, he shot a first-round 70. Michael Bamberger may be reached at [email protected].